Stop the presses, Rocky Mountaineer has released their 2019 vacation packages, and it’s a whole new world of innovative ideas and experiences for you to discover. VANCOUVER, B.C. 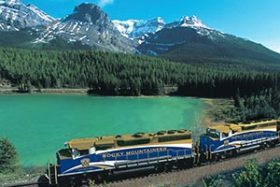 – Rocky Mountaineer, the largest privately-owned luxury tourist train in the world, announces the addition of four new destinations to its 2019 vacation packages. Adding to the excitement of a rail journey through Western Canada, guests can explore the new destinations by rental car, helicopter, or on foot to experience more of the Canadian Rockies than ever before. First Passage to the West Canmore Self-Drive:Canmore is an authentic mountain town 20 minutes from Banff, offering stunning views and a laid-back atmosphere where guests can hike, explore caves, or discover unique restaurants and boutiques. The seven-day Canmore Self-Drive package features lodging at the newly-constructed Malcolm Hotel in Canmore, four days with a rental car to explore the region, and two days onboard Rocky Mountaineer. First Passage to the West Kananaskis Self-Drive:Sprawling across a spectacular mountain landscape, and a 45-minute drive from Banff, Kananaskis is an ideal place to hike, mountain bike, ride horses, play golf, or relax in the Nordic Spa. The seven-day Kananaskis Self-Drive package includes two nights at Pomeroy Kananaskis Mountain Lodge, four days exploring the area by rental car, and two days onboard Rocky Mountaineer. First Passage to the West Sunshine Village Self-Drive:Located within Banff National Park, Sunshine Village sits at an elevation of 7,200 feet with panoramic views of the rugged mountain terrain. Known as a top hiking area in Canada, Sunshine Village offers opportunities for nature walks, gondola rides, biking, and swimming in hot springs. The seven-day Sunshine Village Self-Drive package features two nights at Sunshine Mountain Lodge, four days with a rental car to explore the region, and two days onboard Rocky Mountaineer. Journey through the Clouds Mountain Adventures:With rugged peaks as far as the eye can see, the Cariboo Mountains are stunning in every season. The 10-day Journey through the Clouds Mountain Adventures package features three nights at the CMH Cariboos Lodge, where guests arrive and depart via helicopter, two and a half days of guided heli-hiking, and two days onboard Rocky Mountaineer. 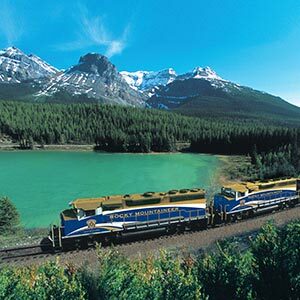 There is so much more to the Rocky Mountaineer than ever before. Be among the first to experience these new vacation packages in 2019!